What would the end times be like without heresy and apostasy? Well frankly, there couldn't be an end time without believers defecting from the faith. "Now the Spirit speaketh expressly, that in the latter times some shall depart from the faith, giving heed to seducing spirits, and doctrines of devils" (1 Tim. 4:1). Most Christians have a basic understanding of deception; however, the majority fails to realize that deception has the ability to take on some very friendly forms. If an eastern Hindu instructor told us, "You are a god," we'd all hiss at him; but let a man like Benny Hinn come along waving a Bible and saying the exact same thing, and we react differently. "As we said before, so say I now again, if any man preach any other gospel unto you than that ye have received, let him be accursed. For do I now persuade men, or God? Or do I seek to please men? For if I yet pleased men, I should not be the servant of Christ" (Gal. 1:9-10). The name of this web page, Heresy Hunters Be Gone, is a quote made by Paul Crouch. When he said, "Be gone," I thought, "I better join the Heresy Hunters" because someday we believers who stand for sound doctrine will indeed be gone, in the twinkling of an eye. So to get into the club, I listed below several links to quotes made by the "Greats of the Faith." A few pages have commentary, but for the most part, I just let these folks hang themselves. I cannot understand how people can follow this man. Hinn has made statements after statements that range from the bizarre to the blasphemous. He has a habit of saying things off the top of his head. I Am A "Little Messiah"
Mr. Copeland is pretty much Benny Hinn minus the goofy remarks. He prefers to stick to doctrines that mangle or destroy the salvation message. As the head of the TBN satellite network, Paul Crouch has the unenviable task of trying to defend the ministers who air their programs on his network. 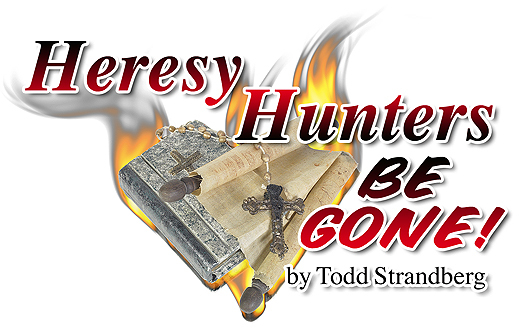 On several occasions, Crouch has prophesied that heresy hunters are on their way to hell. This preacher is quite fond of pictures of dead presidents, especially the type you can fold over and fit into your wallet. Price teaches his viewers that Jesus was rich and that if He lived today, He would own the finest clothes, cars, and homes - like Fred Price. Monkey hear, monkey repeat is about what I say about Joyce. Like her Word-Faith brothers, she teaches the doctrine that claims Jesus went to suffer in hell. Jack is the type of man that should know better. Well, let me rephrase that. Jack is the type of man that once knew better. All of his, life Van Impe preached against the end-time harlot religious system, and now we find him promoting it.